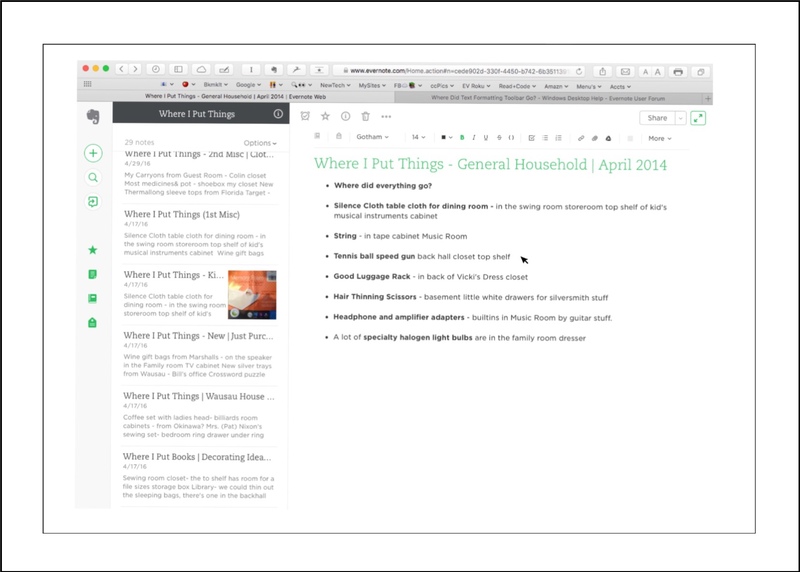 Recently I was editing a note using a MacMini along with the web version of Evernote. Because Evernote’s web version is the only place where you can access a note’s history. I was doing this because I’d discovered that a really important note I maintain (about where I put things) had lost almost all of it’s content!! Using the web app I successfully found the missing content and was in the process of adding it back into the note. While I was doing this, all of a sudden (and right in front of my eyes) I watched as Safari flickered a little and the formatting toolbar was no longer there! At first I thought that this was just a temporary or an isolated instance, so I closed that note and opened anothr one. But the formatting toolbar was still gone. Yet, I still had formatting to do on the original note because I chose the ‘copy and paste’ method of adding the missing content back into the note. Perhaps I wouldn’t have lost all the formatting had I not used Apple’s Note app as an intermediary for pasting. But I did. I’d pasted the missing content into the Apple Note app and then I reopened the Evernote note which was missing the content and pasted it back into its former location (after copying it from the Note app.) But using this method messed up the formatting so I had to ‘rebold’ and ‘rebullet’ many lines of text. After spending some time with Google and reading other user’s comments in various forums I discovered a very quick fix which also highlights some very quirky behavior on Evernote’s part. This was great news for me…but I think it’s pretty odd behavior for Evernote. I don’t know if this holds true for other web versions…like, say on Window’s computers for example. Or, if the quirky behavior is browser specific…then it might only apply for Safari users. I’m writing this on an iPad. When Evernote completely revamped their web app recently they took away the ability to access and use the Evernote web app on mobile devices…so I can’t test this aberrant behavior out using mobile Safari. But regardless of how frequently this quirky behavior arises, I cannot for the life of me, figure out why they would have coded it to act in this manner. If anyone else knows why, please feel free to leave me a comment below! 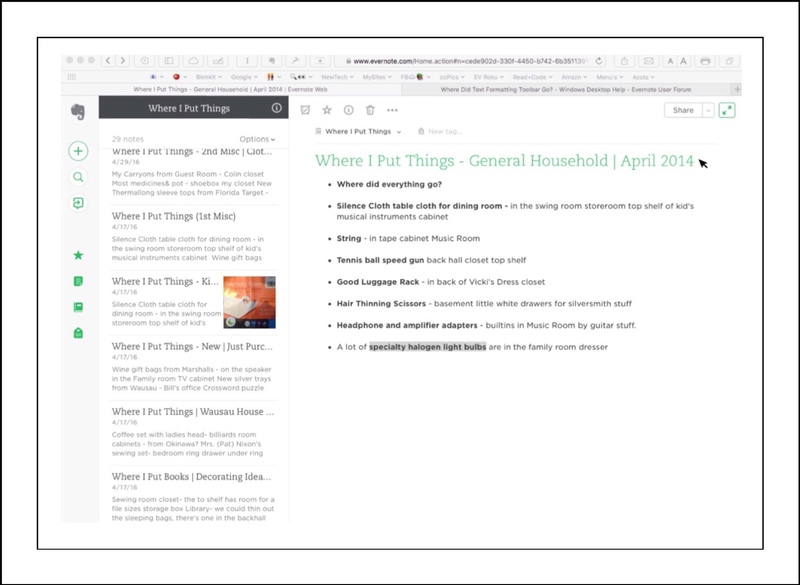 This entry was posted in Evernote, Evernote Hacks, Tech Tips and tagged Evernote, Evernote Missing Formatting Bar, Evernote Tips, Evernote Web App. Bookmark the permalink.